CT2523 - Our best-selling, budget-friendly duffel is sized for sport gear. 600 denier polyester canvas. D-shaped zippered entry for easy access in main compartment. Two large zippered end pockets. Two exterior zippered pockets on front. Padded handle. Detachable, adjustable shoulder strap. 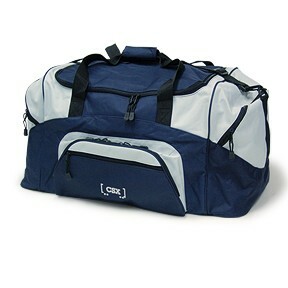 Dimensions: 12.75"h x 27.25"w x 13.5"d; Navy/Gray with white CSX railcar logo embroidered on front pocket.